The Selkirk College Ski Resort Operations & Management Program is a leader in Canadian snowsports education, providing exciting career opportunities for graduates. To keep both faculty and students connected to the industry, the SROAM Advisory Committee stopped by the Tenth Street Campus for its annual meeting. Before the first snowflakes of winter arrived to Nelson, students in the Ski Resort Operations & Management (SROAM) Program had a chance to lay fresh tracks towards their future career in the snowsports industry. 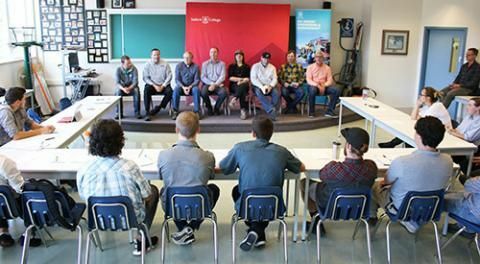 In the first month of class at Nelson’s Tenth Street Campus, learners in the two-year diploma program were visited by industry leaders from across the sector who are members of the SROAM Advisory Committee. The diverse mix of employers, industry association representatives and program alumni sat down with both faculty and students for two days in late-September. The 11-member committee represent the key areas of ski resort operations and winter sport management. 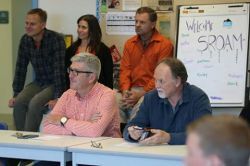 Industry leaders who make up the current committee range from Ontario Snow Resorts Association representative John Ball to Panorama Mountain Resort risk manager CJ Matthews-Dickson to Whitewater Ski Resort general manager Kirk Jensen. Prior to meeting face-to-face with students, the committee sat down with faculty to advise and update instructors in areas within the program that might be becoming obsolete and those that require more focus. The industry veterans who teach SROAM Program students each semester have tremendous depth from their own careers, but the check-in proves valuable for setting curriculum that is most relevant to what employers are looking for in graduates. The SROAM Program was launched by Selkirk College in 1980 and for almost four decades has been educating those passionate about the outdoors. From management and marketing to operations and construction, the program provides an educational depth that is only available at one other post-secondary in Canada. Alumni can be found across the country and around the world, many of them leaders who continue to shape the future of the industry. Students come to Nelson from all over British Columbia and around the globe to gain their education in a community known for fostering a vibrant winter sport culture. Members of the Advisory Committee pay a visit at least once a year to build relationships with future leaders. While in Nelson, committee members had a chance to sit down with students for face-to-face meetings where new relationships were formed. Ski industry leaders were in Nelson in late-September as part of the Ski Resort Operations & Management Program’s annual Advisory Committee meeting. Those in attendance took time to speak with students and include: (L-R) Dan Wilson, Operations Manager at Fort McMurray’s Vista Ridge (SROAM Grad); Christopher Nicolson, President & CEO of Canada West Ski Areas Association (CWSAA); John Ball, general manager of Ontario’s Snow Valley Ski Resort and representative for the Ontario Snow Resorts Association; Tim Foster, Director Sports Programs and Activities at Sun Peaks Resort (SROAM Grad); CJ Matthews-Dickson, Risk Manager at Panorama Mountain Resort (SROAM Grad); Andy Cohen, general manager of Fernie Alpine Resort; Kirk Jensen, general manager of Whitewater Ski Resort; and Don Thompson, general manager at Red Mountain Resort in Rossland. SROAM Instructor Bob Dodge (right) sits with Red Mountain Resort general manager Don Thompson during the SROAM Advisory Board meetings on the Selkirk College Tenth Street Campus in late-September.